After doing a lot of research on the best ways to get rid of mould, I came across a full fledged way to do chemical free cleaning for pretty much anything you can imagine. Ozone Generator Shock treatments – Kill Mould, Eliminate Odours(such as smoker smell), Disinfect entire Rooms, remove insect infestations, etc. 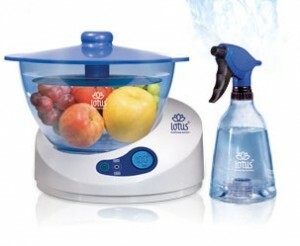 Ozone Water – Washing fruit with ozone treated water (keeps fruit fresh for 2-4x longer by killing surface Mold/Bacteria) also removes pesticides, Ozone water can also be put into a spray bottle and used to disinfect, counter tops, bathrooms, deodorize shoes, animal spaces, etc. Steam Mop – Uses superheated steam to clean the floor and kill bacteria/disinfect. Works easier and far better than a conventional mop or a swiffer. No soap required! Handheld Steam Cleaner – For steam cleaning hard to get off dirt/grime. Use to clean shoes, grout, windows, vinyl in cars, etc. Ozone is one of Nature’s most powerful disinfectants. Ozone (O3) is simply Oxygen (O2) with one extra oxygen molecule attached. Ozone itself is a highly unstable molecule having a half-life of roughly 20 minutes before breaking down into standard oxygen. That means it only retains its disinfectant properties for 20minutes once it has been created. Because of its unstable nature, it has a propensity to bind to anything organic and kill it. Ozone safely eradicates destroys MRSA, H1N1, anthrax, strep, staph, e-coli, salmonella, listeria, legionella, mold, toxic mold, odors, smoke odors, pet odors, urine odors, toxic Chinese drywall with 99.99% effectiveness. Between surgeries in a hospital the surgery room is sealed off and filled with ozone to disinfect the room before the next surgery is performed. Thus ozone is also very dangerous to human health and must be used properly in the absence of human presence for in high quantities it can result in death. The first type of Ozone generator is now considered illegal and poses serious health risks. Breathing in ozone is NEVER good. The second type of ozone generator used ONLY for SHOCK treatments is used in rooms/cars only when there are no humans, animals or plants present. The first type of ozone generator releases very small quantities of ozone over a long period of time to supposedly disinfect living spaces without endangering humans. However ozone is always dangerous and prolonged exposure to small quantities is not healthy. The second type of ozone generator releases massive amounts of ozone at deadly levels in order to disinfect a given space. And thus the treatments are done in isolation. Ozone Shock treatments last typically 2-24hrs and are used to disinfect/deodorize living spaces. Perhaps a recent flooded basement, car infected with mould, or to deodorize a hotel room if smokers had been there before. Of the top two I would only recommend the UV. Corona Discharge while cheaper also creates small amounts of dangerous Nitrous Oxides as a by product of creating Ozone. UV does not. After doing much research on many Ozone generators on the market I believe the UV ozone generators sold by Ozone.ca are some of the best out there. A few notes on doing Ozone Shock treatments. Ozone destroys rubber. Make sure you remove anything made out of rubber from a room. This shouldn’t be much of an issue since most rubber-like products are usually silicon based now a days. Also Ozone travels by air. Open all drawers and cupboards in order to let ozone access spaces. Use fans to distribute the Ozone more readily. I created a ozone Shock treatment procedure plan for rooms in a previous post here. A question that often comes up is, does using an Ozone generator contribute to the Ozone hole in the atmosphere? The answer is No. Chlorofluorocarbons (CFCs) are what destroy ozone in the upper atmosphere, not ozone. 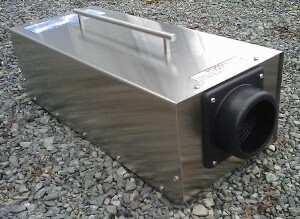 Another question that comes up is, does using an Ozone generator contribute to Global Warming as it is a greenhouse gas? The answer is No. Ozone when used in a confined space such as a room or basement breaks down into regular oxygen in 20minutes. Therefore it wont have any greenhosue effect. When ozone is created outside continually via pollution it does act as a greenhouse gas because its being created 24/7 and reflecting heat rays back to the earth. In addition Ozone outside being uncontrollably created from pollution irritates the lungs and causes issues with asthma. Thus when doing a ozone shock treatment no humans are allowed to be present in the confined space. There is a company named Tersano that has created a Ozone water spray bottle, and an Ozone wash basin in order to wash fruits and vegetables. This is without a doubt the single best way to clean produce brought home from the grocery store. Not only does it kill any mould spores & bacteria on your produce it also destroys chemicals. Often I buy organic produce and because it hasn’t been treated with chemicals it becomes mouldy very quickly. Using the ozone fruit/vegetable basket keeps my expensive organic fruit fresh for much longer! 2-4x longer. Now I only wish produce manufacturers and grocery stores used this technology. Tersano also carries a professional Spray Bottle cleaner that you can use to spray down and clean/disinfect counter-tops, fridges, sinks, bathrooms, shoes, etc. This is a much more environmentally friendly and in the long run cheaper way of doing household cleaning. No more buying nasty chemical cleaners or soaps. Tersano appears to be the only company on the market to offer ozone-water cleaning systems. For now it appears to have a monopoly. When looking for a chemical free way to clean the floor I came across Steam Mops. 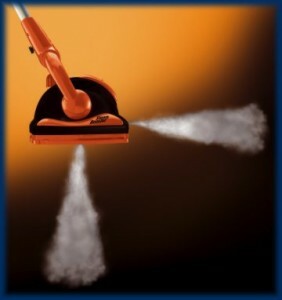 Similar in their practical application to ozone, Steam mops release super heated steam to clean away dirt and grime on the floor, and the steam is hot enough to kill bacteria, viruses and to disinfect. Now you might think something that amazing would be really expensive, but a high quality steam mop can be found for $70 -$100. Whatever you do, do NOT buy a Shark Steam mop. It seems all the home stores sell them, and they do not create hot enough of a steam in order to disinfect. There is a really good review of all the steam mops on the market here. I chose the Euroflex Monster EZ1 because it is made out of better materials and gets the steam to 266F, the hottest steam mop on in its class. The Euroflex also comes with a carpet cleaning attachment so you can steam clean carpets where as the Eureka does not. I haven’t done the research on this on yet but it appears the Monster 1200 Steamer Cleaner seems to be a good buy. 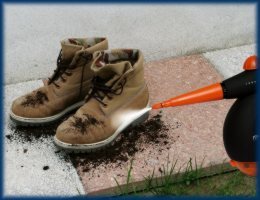 For all the really tough dirt, such as on shoes, dirt embedded on the vinyl in your car this steam cleaner seems to be the best choice as the ultimate way to clean things that have gotten really dirty. Plus the superheated steam disinfects as well.